In an article posted the 27th of November 2018 the Belgian newspaper De Tijd claimed that the health damages by road traffic related air pollution costs the European Union around 62 billion euros a year. This claim turned out to be mostly true. Table from the EPHA study on the costs of air pollution. The 13-billion-euro margin is due to the use of different calculation methods. When using TRUE-based factors, the costs are 20% higher than when using COPERT as calculating criteria. Professor Int Panis concludes that the results of the EPHA study are not absolute but are also hard to check due to there not being many other studies of such a large scale. 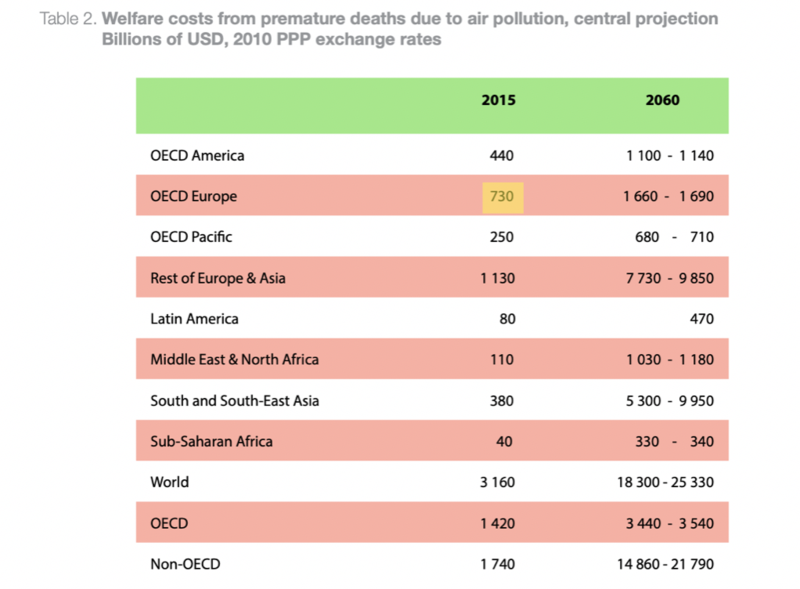 Table from the OECD study on the economic consequences of outdoor air pollution. In short, while the study’s credibility is hard to check due to its incomparable large-scale research, the air pollution experts believe that the results of the EPHA study are most likely a correct estimate of the costs of health problems due to traffic related air pollution. We conclude that this statement is mostly true.